The coastal foundation of your beach home is perhaps its most important structural element. Without a solid foundation, the rest of the house falls apart. In most residential construction zones, typical foundation systems are adequate to meet the needs of the residents. This is not the case with a waterfront property; while the dream of many, poor soil conditions, heavy winds, and rushing flood waters can quickly destroy a home and ruin the dream. In coastal home building projects, the harsher conditions of the environment make it more difficult to design a stable coastal foundation that will last. 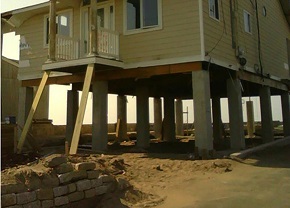 A foundation built on sandy ground is subjected to erosion and scour. The danger is that the land beneath the foundation will be removed out from under it, causing the home to collapse. For this reason slab construction is almost universally prohibited in most building codes for coastal areas. Structures will need to be supported by some variation of a post and beam style foundation. Sea swells can suddenly rush up against a house. The greater the surface area contacted by the water, the greater the danger of the structure collapsing. Coastal home building codes often require an open foundation with a minimum required height for the main deck. This lifts the home up on stilts and allows the water to flow safely beneath the house. The depth that the beams are sunk into the ground is also important. Improperly anchored foundation beams can be dislodged in heavy storms. This can cause the house to be tilted, making it unsafe for habitation. There are many different techniques for setting and anchoring the beams. It is best to consult with a contractor who has experience working with the particular qualities of the soil in your area. It is always the builder’s responsibility to know the local zoning codes and requirements for foundations for a coastal home building. To reduce the risk of having your home wrecked by severe weather conditions, make sure you take every precaution possible. At Payne Construction Services we can provide proper coastal foundations for your beach home. Using helical piles, we can ensure that your structure meets the zoning and building codes in your coastal town. Call us today or click here for a quote to learn more.